There are so many times I wonder if I am doing the right thing in every aspect of my life. For the most part, I think I am, others can decide for themselves. Of course there are things that I know I need to work on. But more importantly, I ask myself if I am happy with my life, which I am. It’s strange. Just the other day, I was at a company dinner. After a few drinks and laughs, it got all serious. The question about ‘where guilt derived from’ came up. Of course, my instinctive answer was religion. Religion is always a touchy subject, especially when most of my co-workers are 50+ and heavily rely on religion. It is also no secret that our generation is not that religious, which I think it is due to the fact that more are educated than the past. I respect people and their beliefs. I am not one to judge or preach one to change. Rather, I embrace religion and try to learn more about each. Nonetheless, my journey started when I started Sunday School back in the day. I thought maybe if I did everything that I was taught, then better things would happen for me. At first, I would pray for a puppy. That didn’t happen. Then, I would pray for better grades without studying. That clearly wasn’t working in my favor. Don’t get me wrong, I would pray for bigger things, like to one day meet Britney Spears and/or Johnny Depp. Again, no go. It started getting deeper than that. I questioned why there was so much pain and suffering. I am pretty sure they pray in some way, shape or form. But clearly it was working against them. Someone tried to explain that there needs to be suffering to remind us of what we have. But how is that fair? Why are those suffering subject to suffering? It didn’t make sense. I couldn’t accept that this “higher being” is out there for everyone, but in a high school atmosphere where the popular kids are in favor. For months, I was in a constant battle with myself. To admit that I see no truth in the religion that I have been practicing was probably the hardest thing I have ever done. With that came; ‘what do I believe in then?’ I started to look more and more into different religions. I grew up in a predominately Jewish town, so I was exposed that religion. And America was born on Christian beliefs so that was just a natural substance. But nothing clicked for me. Nothing answered the main question; what religion will bring me inner peace? I think in reality, after witnessing people being chastised for their beliefs due to actions of others was what really made me think. Why do people care so much what your beliefs are? How does that impact the sole person that is questioning such? Then after much research, I found that many of human wars were due to difference in beliefs. That’s rather ironic. You are shedding blood due to how one lives their present life in preparation for their after-life. I think it was freshman year of college when I really accepted that I am a non-believer. When I say that, I mean that I do not define myself by the means of others and their beliefs. I am not here to say that every religion is wrong because I don’t believe that. I am not saying there isn’t a higher power because I don’t believe that. I am just saying that I don’t believe in religion personally because no one died and came back to tell me what’s really out there and that will always have a cloud over my inner peace. The idea of picking the wrong choice will become a constant dismay which I rather avoid. When I came to acknowledge that to myself, I decided that I can say I am this or that way, but without proper knowledge and/or research, I am never going to be self-satisfied with my choice. That is when I decided that I am going to take religion up as a minor. I studied an array of subjects relating to religion. Some very much surprised me; others boggled my mind on how it overcame and flourished as a belief system. I will say that if I were to belong to any religion, it would be Buddhism. It is the only one that makes sense to me. I believe in the idea that we are all a piece of the bigger picture and that should always be set within you. With my ventures, I think about how it will affect others and is it what I want to portray. That is very important to me. I always forget that I have tattoos. It’s always awkward when you find someone eying one, trying to be discrete. My favorite tattoo is the one that I have on my arm. 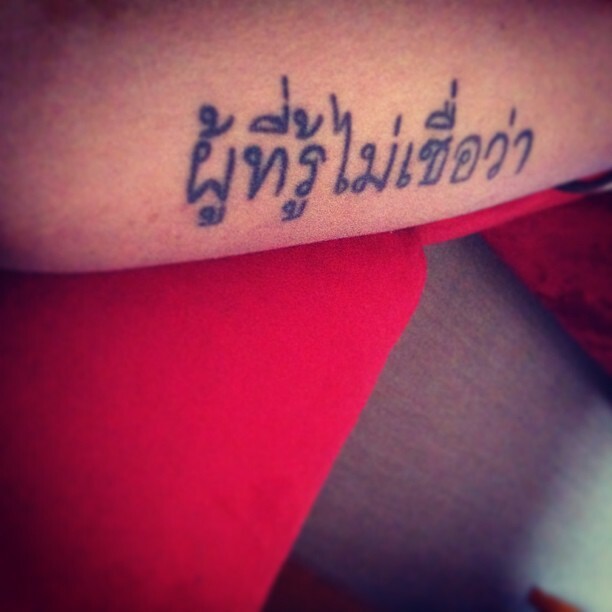 In Thai, it reads, “those who know do not believe”. And I truly believe that. I decided a long time ago that I need to avoid regrets and live life with integrity. I believe in my ethics and morals that I see fit to satisfy my inner peace. Some may think I am brutally honest, but I cannot help but to call it how I see it, especially if you are going to ask. I have guilt because I know people do not have the opportunity to better themselves like I do. I don’t believe in stress. Yes, I know it is hard to avoid, but I always remind myself that stress doesn’t lead to anything but more distress and struggle. I believe that to every problem there is a solution. Let it be small or large. With some effort, it is attainable. I believe in dreaming big because ambition is key to opening doors for others. I believe in looking at the other side of every story because there’s a detail that might be worth paying attention to. I believe in being proactive in life because you might only live once and this is your time to shine. I believe in love, but only if it makes absolute sense and helps you become a better person. I believe in positive energy. Without positivity and support from the closest people in your life, becoming a better version of yourself becomes difficult. The hardest one for me is tolerance. I have patience, but when it runs out, that is when I am at fault. (However, with some meditation, I have found a short sigh of relief. ) I believe in myself and that I am a good person. I remember that I make my decisions that relay to who I am inside and out. But of it all, I believe in people. I believe that people want to do good and that we will get there one day. And that is the basis of my religion. On aside:: I am a huge fan of MS MR and this song takes my emotions on a roller coaster ride. Take a listen.